All worthy, except those first two of course, but for my money it simply has to be the gynormous seven disc box set of Back to the Future: 25th Anniversary Trilogy from Universal. 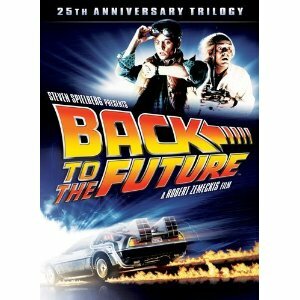 Which is to say, all three BTTF flicks in newly restored high-def versions, with digital copies of each and a seperate disc of bonus material that takes longer to sit through than the entirety of Matthew Barney's Cremaster series, albeit with more laughs. Clearly, this is the kind of thing more suited to gift giving than serious critical analysis, which is to say that of the three films, while all are entertaining (decreasingly less so in order of release), only the first is truly worth revisiting. It's an all but perfect Hollywood entertainment, actually, with a canny mix of pop culture savvy, cleverly worked out time-travel paradox stuff, still way cool special effects and, of course, an Oedipal nightmare at the center of it, just to give it a little psychological depth. The second in the series drops the ball on that high concept -- if only star Michael J. Fox's Marty McFly character's future daughter had had the hots for him the way his future mother had in the original! -- but it compensates with more fun time-travel twists and a generally breakneck pace. As for the third, let's just say that the Z.Z. Top joke is pretty funny and leave it at that. Here's a clip (from BTTF 2), included in one of the bonus features with the set, that kind of blows my mind, though. Marty McFly: Uh, Jennifer, um, I don't know how to tell you this, but I... you're in a time machine. Jennifer: And this is the year '2015'? That clip, via a publicist for the set, arrived in my inbox yesterday, which of course was October 21. Which is also my birthday. Coincidence? I think not. In any case, I haven't been so amused by a movie quote since the line in the first Superman movie about Lex Luthor destroying Teaneck, N.J., i.e., my home town. As I mentioned earlier, the new set includes recently remastered high-def prints of the three films, all of which look and sound fresh as paint. As for the bonuses, some of them have appeared on previous DVD editions, but there's two hours of new stuff, which is to say more interviews with the creative team, some previously unseen storyboards and a featurette that looks into the real physics behind the time travel stuff. None of it strikes me as the kind of thing you'll want to watch more than once, but then again, what do I know ?-- I still treasure my old VHS copy of The Making of Lionel Ritchie's 'Dancing on the Ceiling' video. In any case, you can -- and if you have the disposable income, I say by all means go for it -- order the Back to the Future anniversary trilogy over at Amazon here. Movies That SHOULD Have Had Sequels (But Didn't) and Movies That DID Have Sequels (But You Wish They Hadn't Bothered)!!! Followed by Police Academy(s) 2-6, until ending with Police Academy 7: Mission to Moscow and the thanks of a grateful nation. Bobcat Goldthwait, asked why he had agreed to reprise his Zed character for the 6th installment, probably said it best: "Because there were so many questions left dangling from Police Academy 5." Come on -- haven't you always wondered what happened to Bogart and Claude Rains after they walked off into the fog to join the Free French forces in Brazzaville? The sequel to two of the most perfect American movies ever made doesn't work for a lot of reasons, only one of them being the disastrous casting of the director's hopelessly out of her depth daughter in a pivotal role. Mostly, of course, it's because the whole thing is utterly redundant, down to a final scene -- Al Pacino's tragic Don now aged and alone -- essentially recreating the one in the closing moments of Godfather II. A classic of "what were they thinking?" filmmaking. Come on -- you weren't secretly hoping for The Sorrow and the Pity II: Electric Boogaloo? A rock-and-roll version of the old Doc Savage pulp novels, and one of the quirkiest and funniest movies of the 80s. As the end credits begin, the scroll announces the next installment in the saga -- Buckaroo Banzai Against the World Crime League! Director Richter and screenwriter Earl Mac Rauch were probably kidding, of course, but still, I've always regretted it never got made. As has, I suspect, everybody else in the film's devoted cult following.